For many travelers, the accommodations are just as important as the destination. And no wonder, today’s top-class hotels are a destination in and of themselves. From boutique hotels that make you feel like one in a million, to hotels that boast every luxury imaginable, this list of the best hotels in the world showcases some genuinely spectacular hotels. Be warned though, after seeing how spectacular these hotels are; you may feel the urge to book a trip and check into one of these fantastic hotels! If you do have this urge, use our list of the best travel sites to help get you there. Hong Kong’s oldest hotel, The Peninsula is the epitome of class and elegance. It is also just steps from Star Ferry, cultural attractions, and luxury shopping. It is one of the best-located hotels in Hong Kong. The Peninsula also offers a VIP guest program. This includes a private helicopter ride, yacht excursion, and transportation back to the hotel via Rolls Royce. Ginzan Hot Spring Fujiya Inn is actually an expertly restored 350-year-old Japanese bathhouse. It boasts five natural hot spring baths among other world-class amenities. Add in the scenic countryside, sea-inspired dining options, and it is easy to see why Ginzan Hot Spring Fujiya Inn is on this list. A legendary hotel situated in the heart of Bangkok, the Mandarin Oriental offers sweeping views of the Chao Phraya River. The Mandarin Oriental also boasts nine different restaurants and a top-notch spa. This truly is a destination hotel that will have you enjoying every minute of your stay. In between restaurant and spa visits, be sure to take a Thai cooking class at the hotel’s renowned Thai Cookery School. Located in the south of France, La Colombe d’Or is part hotel, part restaurant, and full of art and history. The hotel is an original, authentic southern France experience. For a full-service, charming experience, La Colombe d’Or is not to be missed. With views of the Ionian Sea, The Westin Resort Costa Navarino is beautiful inside and out. The hotel also offers a number of children’s activities, infinity pools for each room, and fresh, organic meals in a variety of restaurants. There are also several golf courses located just minutes from the hotel. Blending century-old history and modern amenities seamlessly, The Gritti Palace is fit for royalty. It is also home to Venice’s largest rooftop terrace. From here you will be able to enjoy spectacular views of the Venetian lagoon. While on the terrace, be sure to also check out The Gritti Palace’s iconic restaurant and bar. The bold and modern architecture of Fogo Island Inn is truly inspiring. Although a radical design, the Inn’s suites still give a nod to the past. Also, each of the Inn’s suites beautifully showcases the Newfoundland scenery. No matter the time of year, Fogo Island Inn is a true getaway that will reconnect you with the great outdoors. With towering mountains and deep blue lakes, a visit to South America’s southern tip is an adventure for the senses. Tierra Patagonia Hotel capitalizes on this sense of adventure. They offer world-class accommodations made with inviting and locally sourced materials. The hotel also provides handpicked excursions, top-notch spa services, and of course, stunning views. Private and unique, Little Palm Island is a five and a half acre paradise in the Florida Keys. They offer 30 oceanfront suites and no telephones, televisions, or guests under the age of 16. Little Palm Island is the perfect place to get away from it all to unplug and relax. If stunning beach tranquility with top-notch service is what you are after, look no further than Little Palm Island. Southern Ocean Lodge in South Australia on Kangaroo Island is a luxury lodge with all the amenities. Rugged coastlines and pristine wilderness surround the lodge which allows for great sightseeing, while the stunning interior is both sophisticated and comfortable. For a unique taste of Australia, Southern Ocean Lodge is not to be missed. The Phinda Private Game Reserve offers unparalleled views of one of the most unique ecosystems in the world. Its signature floor to ceiling glass walls will allow you to take in nature like never before. Adventures also abound here, including specialist safaris, night turtle drives, and beach adventures. All of these activities are going to ensure that you always have something exciting to do. Built in 1835, Rambagh Palace had many royal residents before it became a luxury hotel. Now, the palace offers 78 restored luxury suites, fit for any royal. In keeping with this theme, the hotel also provides some of the best fine-dining available. Signature spa treatments and wellness offerings like yoga and meditation are also available. If you have ever wanted to feel like royalty, book a stay at Rambagh Palace. Bordering Burma and Laos, the Four Season Golden Triangle in Northern Thailand is glamping at its finest. Interacting with rescued elephants is a regular activity here, while breathtaking mountain trails and vistas add to the ‘get away from it all’ feel. In the heart of Los Cabos, but still secluded and exclusive, the seaside and cliffside Resort at Pedregal is the perfect place to escape and unwind. Private pools and ocean views are going to cater to all the water lovers, while foodies will appreciate the locally-inspired gourmet dining at the hotel. With sweeping views of the south-west of St. Lucia, Jade Mountain is a bold hotel that provides stunning Caribbean views. Guests will be able to spend time at the infinity pools that are reached by private bridges. When not relaxing, there are restaurants, bars, and watersports at two separate beaches to take advantage of. With a dramatic suspension bridge and carefully crafted villas, Four Season Sayan in tropical Bali is a cut above the rest. The lush surroundings and peaceful ambiance make the Four Seasons Sayan a place to relax and rejuvenate. On the other hand, excursions like temple pilgrimages and white water rafting provide spiritual and adrenaline boosts. A stay at Great Plains Zarafa is a stay that gives back as guests contribute directly to animal conservation. Their stay helps to fund saving big cats and other critically important African wildlife. The camp features four exquisite luxury tents and overlooks the crystal blue waters of the Zibadianja Lagoon. Wildlife like buffalo and elephant flock to these waters by the hundreds. So if you have ever wanted to go on a safari or support wildlife conservation, Great Plains Zarafa is for you. Voted the best hotel in South America by Travel and Leisure readers, Cavas Wine Lodge is a luxury lodge at the foot of the Andes mountains. The Lodge also offers top-notch spa services and fine dining for those looking to relax. For those looking for adventure, they offer excursions like horseback riding, rafting, zip lining, and hiking. An all-inclusive vacation experience, Triple Creek Ranch is a luxury ranch resort. The ranch lodgings consist of private log cabins and ranch homes clustered around a well-appointed lodge, and endless all-inclusive outdoor activities will take care of the entertainment aspect of your stay. For a rustic yet elegant Western adventure, Triple Creek is the place to go in the Western United States. With sweeping views of an untouched coastline, Kauri Cliffs Resort offers views of some of New Zealand’s best scenery. Between trips to the beach, guests can enjoy locally sourced meals, award-winning golf, helicopter tours, and more. For a once in a lifetime experience, Kauri Cliffs Resort is the way to go. Just 30 miles northeast of Tahiti, The Brando is a luxury resort on a beautiful private island. White sand beaches, private villas, and environmentally friendly buildings make for a culturally rich and rewarding visit that gets you away from it all. If you crave privacy and sun, The Brando is the place for you. A boutique hotel that was created as a place where friends “would like to stay at,” the Home Hotel is both trendy and homey. The hotel offers a bar, a spa, a pool, and refreshing cocktails, all in a friendly environment. In true friend fashion, Home Hotel also offers city tours and bike tours of Buenos Aries, a nice feature that keeps guests coming back. An upscale resort located on 243 acres of pristine scenery, Ventana Inn and Spa is both sophisticated and rustic. California coast and forest are at the inn’s doorstep which allows for outdoor adventure. And, with iconic Highway One down the road, scenic adventures can be had in almost every direction. Located on the Big Island, the Mauna Kea Beach Hotel is the premier landmark luxury hotel on the island. The scenery around the hotel is second to none and will add a backdrop to everything that you do here. With a championship golf course, an 11-court seaside tennis club, museum-quality art, and a variety of Hawaiian cultural activities, you will have plenty to do here too. Occupying prime real estate atop Empire Pass, Montage Deer Valley is a luxury mountain resort destination. In addition to ski-in/ski-out access to one of the best ski resorts in the country, Montage Deer Valley also offers amenities like a bowling alley and fireplaces in every room. 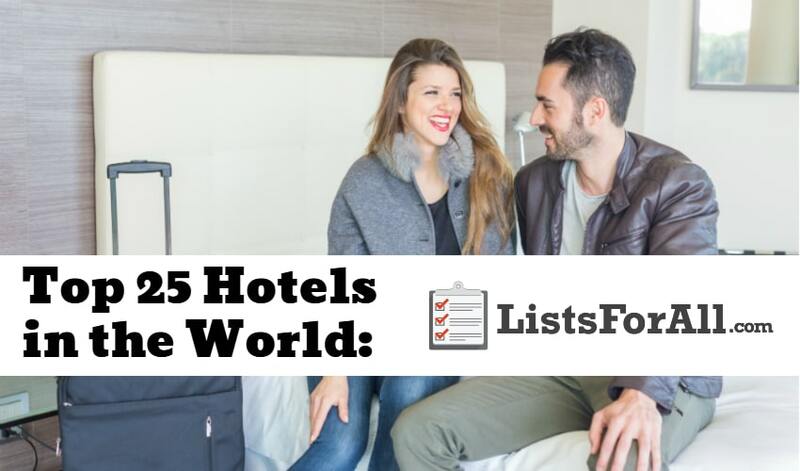 The great thing about this list of the best hotels in the world is that these hotels are also located in some of the best places to visit in the world as well. So not only will you get to stay at one of the best hotels available, but you will also be able to visit one of a kind places. That being said, these hotels are so amazing that you may not want to leave them. If you are an avid traveler make sure that you check out our list of the best travel accessories as well. This list will provide everything that you will need on your trips. Have you already stayed at one of these hotels? We would love to hear your feedback in the comments below.